Asus's UL50 range is targeted at those with usability and portability in mind, and by and large the UL50VT provides just that. What the machine may lack in raw processing power, it makes up for in portability and while there may be some usability niggles, this remains a very accomplished machine with the best battery life available. This is the only laptop in this test not to feature a processor from Intel's new Core family and, as a result, processing power can't match the competition. However, to combat this Asus has included a technology it has called Turbo 33. When activated at the push of a hotkey the processor is overclocked to give you, the company claims, a 33% average performance increase. During testing we found the feature boosted processing power by 21.4%, which while not quite 33% represents a significant improvement in performance. As a result, you'll be able to run most applications with ease, although multitasking with resource-intensive programs won't be as smooth or as fast as with other laptops. 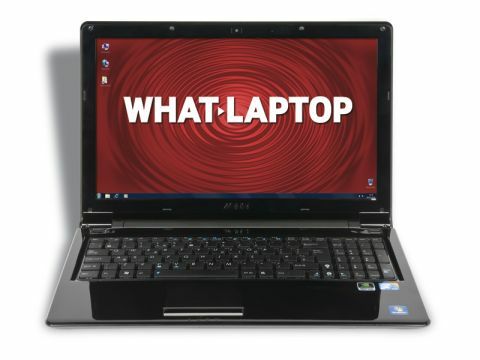 The laptop also features two graphics cards, an integrated Intel chip and a dedicated Nvidia offering. Dedicated cards are very resource-intensive on a laptop's battery, so the idea is to switch – with the touch of a button – to the Intel chip when you're after the maximum battery life. In this mode we squeezed a formidable 556 minutes from the battery, offering over nine hours of power. This is an excellent result, meaning if you're after portability this is the machine for you. The 2.4kg the laptop weighs is also the lightest here and is impressive considering its 15.6-inch screen size. Incidentally, we also noticed that the Turbo 33 technology provides an increase in graphical performance of around 1.8%, which will make photo and video editing slightly quicker if you need more power. The laptop looks great, with the brushed-aluminium lid providing a high-end feel, and the large screen is a joy to work on. The keyboard is decent, but quite spongy. It's not uncomfortable to use, but doesn't feel as solid or as well built as the likes of the HP Probook or Sony VAIO. Asus' ExpressGate software feature is also present, alongside top-notch connectivity, which means you will be able to connect to wireless or wired networks at the fastest speeds currently available.